A WORKING studio, a soaring palace, a temple where the past's shadows cluster and hang thickly in the air: such is the new Jilamara Arts & Crafts Association art centre complex at Milikapiti on the remote north coast of the Tiwi Islands. It is the last building project of an admired Northern Territory architect; it is a symbol of the Tiwi people's vision for the future of their culture -- but, more than this, the gallery and museum bring the full sweep and history of Tiwi painting and carving before the eye. At last, this distinctive art can be seen and appreciated in the heart of the lush landscape from which it springs. Hence the joyful mood in the community earlier this month on a monsoonal, post-cyclonic morning as the dances and ceremonies to mark the project's completion were held. There are three buildings at Jilamara now, buildings with linked functions, marked out by their tongue-twisting Tiwi language names. The refashioned Muluwurri Museum, named in memory of a local family patriarch, provides a select overview of 100 years of Tiwi artistry, running all the way from archival photographs taken by Baldwin Spencer to recent prints by established art-world stars. Alongside, the new Kutuwulumi gallery and storehouse bears the traditional name of the most famous Tiwi painter of our day, Kitty Kantilla. Kantilla's last works, a set of majestic canvases, small in scale, fine in detail, hang there, shown together for the first time alongside a striking new piece by the young artist who has assumed her mantle, Pedro Wonaeamirri, chairman of Jilamara. "The old lady was like a teacher to me," Wonaeamirri says. "I have fond memories of her." Behind the gallery is a high-roofed workshop: the Murrunungumirri carvers shed, named for the most famous old carver of island funerary poles. And so the heroes of the art tradition have not vanished: their names have power, and live in memory, past and present interpenetrate. Such is the structure of the new Jilamara, built on the foundations of Tiwi ceremonial life. Just as the most keenly collected Tiwi artefacts have always been the pukumani poles set up for the dead, and the designs and ochre colours used in the various art workshops on the two islands look back to funerary and increase ritual, so it is with the reborn art centre, in large part the result of three years of keen advocacy by a dedicated pair of art co-ordinators, Cher Breeze and Barry Hayes. 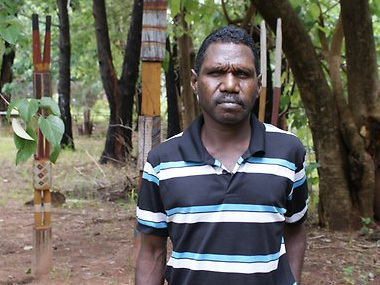 In the couple's time at Milikapiti, the careers of a range of Jilamara artists have flourished. Newcomers sych as Pauletta Kerinauia are launched on their path as painters. Timothy Cook and Conrad Tipungwuti are established solo artists, modernisers of the old design tradition: Raelene Kerinauia, long a staple mid-range figure in group shows, has flashed into prominence as a maker of intricate and subtly detailed works on bark; Janice Murray and Wonaeamirri have gone from strength to strength in media as diverse as carved wood, etchings and cast bronze. This upswing at Milikapiti is set in context by the museum building, which has been developed from a homely, long-established "keeping place", and offers the chance to see the traditional roots of today's Tiwi art alongside vanguard works. Even a brief inspection is enough to confirm what northern insiders have always known: that the visual language of the islands is distinct and is constantly being reinvented. The fierce beauty of the dances and body designs recorded for the first time in 1912 by ethnographers is echoed by the rough-hewn, massive mortuary poles from the mid-century shown here. The comb dots and score marks on the newest canvases of Wonaeamirri look back to the designs on a triad of pukumani poles from the hand of an old sculptor, long dead, and too little known today: Nancy Henry Ripingimpi. Across the museum's main gallery a group of paintings hung on a single wall illustrates these continuities. The eye is drawn at once by a spare, elusive gridwork of ochre squares: a late piece by the second queen of Jilamara, Freda Warlapinni. Adjacent to it is a cross-hatched bark in deep blood-reds by Kerinauia: two generations, a shared poise and grace of tone. Jilamara's artists are already treating the new museum space as an extension of their studios nearby: they can see their family history and the patterns of their lives when they walk through. They also see a selection of the latest artworks made on the islands, and some of the finest, for Jilamara has a modest acquisitions budget of its own. A small side display holds a selection of these more recent creations: a vivid piece in reds and yellows by Cook and a set of etchings by Kantilla, the most naturally gifted print-maker to have emerged in all the region of the Top End. Throughout, the principle that rules the art on view is rhythm: rhythm in dot and line, rhythm in the placement of the fields of colour. In much the same way the body painting marks -- the jilamara -- for ceremonial performance seem like notes of music, and intensify each dance's movements and steps. With the opening of the complex at Milikapiti, Tiwi art thus comes home and can be viewed in its full sequence. For the Tiwi people on the islands, the museum and gallery are part of a general assertion of cultural survival: the carvings and paintings speak of persistence; they are the outward trappings of an inner strength in the face of upheavals. When strangers came to the islands, and when Catholicism came, an ordered, compact society was placed under stress. Culture and language could easily have been stripped away. But island leaders recognise the importance of cultural memory, and the importance of its storehouses as well. Aboriginal people of traditional stamp tend not to keep the indigenous art of their country on the walls of their houses, but many of their number put a certain value on having that art nearby, in museums or closed stores. Such places give them a record of their fast-changing history and the mixed joy and sadness of remembering their vanished kin. There are other museums on the islands: a history display associated with the church and school at Wurrumiyanga on Bathurst Island, and a small gallery a street away at the studio of Tiwi Design, while the disability art centre of Ngaruwanajirri is itself a kind of artwork, with its frescoed ceiling designs. 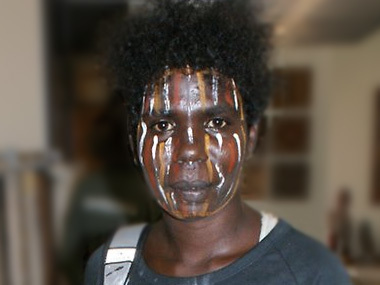 But Jilamara is one of the standout Aboriginal community galleries of a new wave. In the past decade, with floods of federal money being poured into art centres across the centre and the north, many facilities of this kind have opened: Warburton, Warakurna, Mowanjum, Kununurra and Warmun are only a few. Their chief significance is as potential hearths of local cultural pride, no matter how managed and artificial they may be, and no matter how clear their role as shop-windows for a passing tourist trade. They mark a slight break in the pattern of a universal export trend in Aboriginal art, a flow of culture emblems from the communities outwards, into the collections and museums of the wider world. More than this, the existence of places such as Jilamara hint at a new possibility: the eventual creation of dedicated, high-grade regional museums in Aboriginal communities, with the art on view managed, interpreted and controlled by traditional leaders, and at least a fraction of the vast overlapping holdings kept in the storerooms of southern public galleries returned to their places of origin. All this lurks in the facade of the new Jilamara buildings as they blend their curved lines with the green surrounding canopy of stringybarks. They are the testament of Darwin-based Troppo Architects director Greg McNamara, a man of subtlety, whose engagements with the remote Aboriginal world were strong. He was killed last year, together with his partner Lena Yali, in a vehicle accident in Darwin's suburbs. Like the many Tiwi artists whose memories are enshrined in the new Jilamara, the tone of his being endures in the space he designed.